Leila, you have a knack for choosing the right colors. You also have a great knack for making the “art charms”. 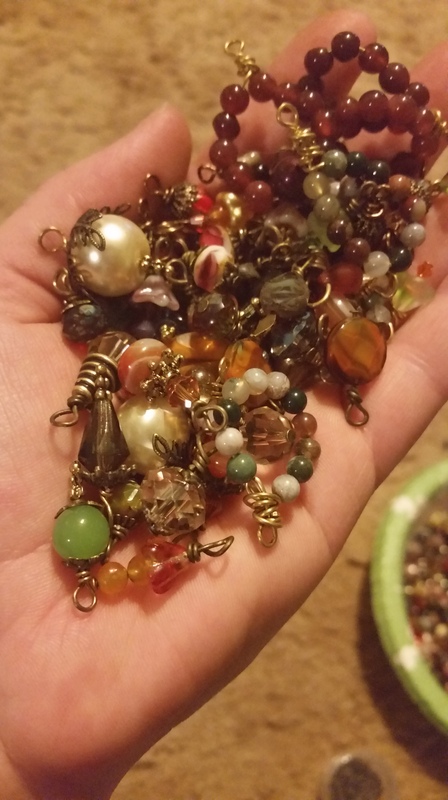 I’m going to pm you about Art Charms and an annual charity “swap” we have. 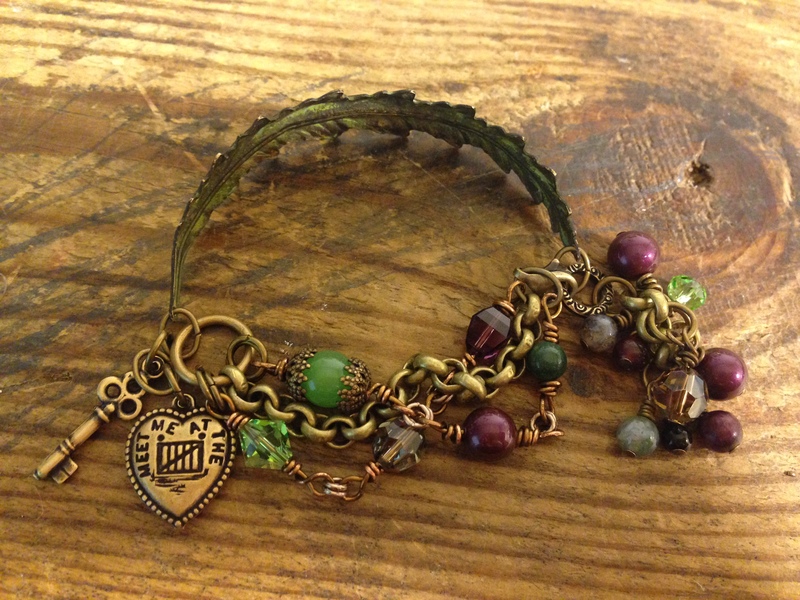 You could make just an art charm as one of your lower end pieces. Think about it. Lots of folk just buy a charm and, girlfriend, I’ve seen the “art charms” sell for over 20 bucks! That said, I love your colors. 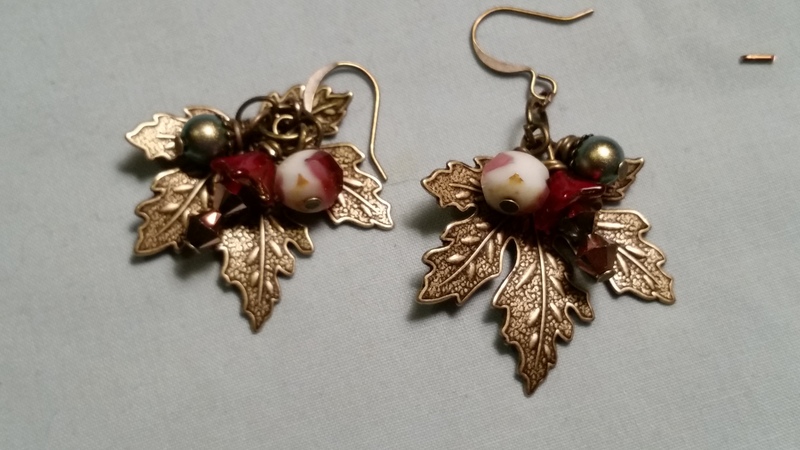 The spring earrings are to die for! Well done! Thanks so much! I’ve been told time and time again I have a knack for colors. My Mom is a Painter though so I’m sure it’s in the genes. I can’t draw or paint like she can. My talents seem to lie in other areas. Like I can make up a Poem in 5 minutes or less and pick out a top to go with pants that are hanging in my closet and not with me for comparison. Lol. We all have Talents. I’m just Blessed to have an opportunity to make some money with mine. Lol. But, joking aside thanks for reading and commenting and thinking of me. OMG I’m in love with your Fall set. It’s gorgeous! Those earrings are beautiful, Leila. This class is transformational for so many of us. What a bonus, right? Great job. Looking forward to your next post. Thanks so much for reading and commenting. I’m sure having fun with this. It has given me the confidence to begin to approach stores to try to get my Jewelry in. It’s changing my entire life! It’s amazing what positive reinforcement can do as well as the feeling of having people rooting for you. Joining the Creative Group and applying for this Challenge was the best thing I could have done!! Thanks, Marica! Honestly, I worried stream lining and assembly lining the charms would take away from the creative experience but it had the opposite effect. Who knew? 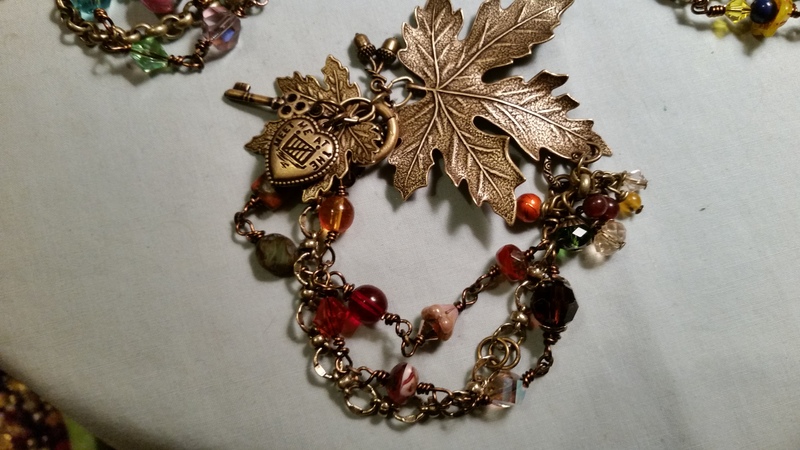 On a totally unrelated topic my Mother and I were going through a batch of costume jewelry we’d gotten at an Estate sale and came across a piece that had “handmade in Malta” on the back. I thought of you. We set it aside. I just thought what are the odds, you know?? Oh wow what a coincidence and what a small small world we live in! Well it’s definitely not mine because I’ve never put “handmade in Malta” on them lol I do mention it in my promos, etc sometimes. I too am having fun with batch working although I haven’t gotten as good as you. I can hardly wait for the entire line to be finished – absolutely in love with your fall series! Wonderfully done! Thanks so much for reading and commenting. I just love the different Seasons and I modeled the colors after my own Gardens. Summer is just a party of primary colors, Spring brings pale yellow daffodils and pastel iris, Winter Hellebore and Fall brings the changing of the leaves and the Asters. So, I didn’t have to look far for my inspiration! ThesE colors are wonderful and really do fit the seasons! Thank you, Erin. I was hoping they would. Thanks for reading and commenting! I’m in love with the fall set. It’s all getting a big WOW! from me, though. Nicely done! Thank you! I’m pleased with how it’s turning out. I have to admit I was especially pleased with how those beautiful Maple leaves looked though I can’t take any credit. I didn’t change a thing about them because they were stunning as is! I absolutely love your concept. It is hard to decide which season to pick. 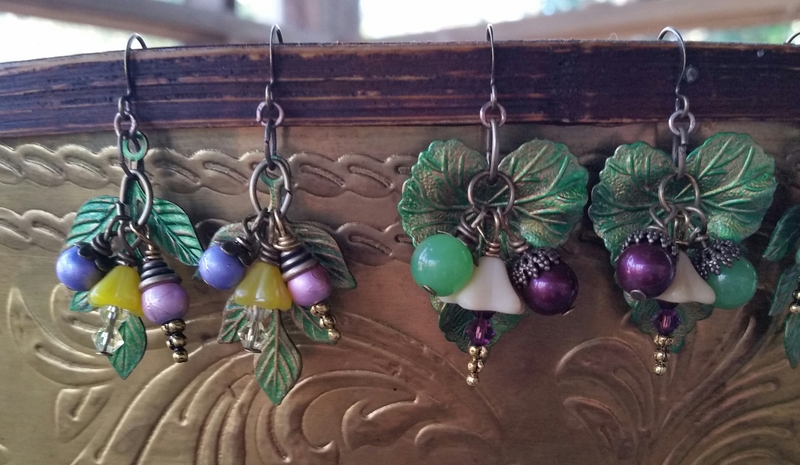 But I have to say those spring earrings are gorgeous. I can’t wait to see what else your line will have. Thanks so much for reading and commenting. I know what you mean. I wore the Summer cuff bracelet today and all those bright colors just made me happy every time I looked at it. Hopefully, customers will feel the same way!! Thank you. I’m inspired by the changing of the Seasons and each color combo they represent. Thanks for reading and commenting. Your designs are truly inspired! I love your spring and summer series, maybe because I’m wishing winter would end 🙂 Can’t wait to see your necklaces! Thank you! I think Summer looks like a Party! But they’re inspired by my own yard during the Seasons. In Summer I have lots of bold primary colors, in the Spring my pale yellow daffodils and pastel iris, in the Winter my Hellebore and the Fall the changing of the leaves and the Asters. So, Nature truly is my inspiration. God is the original Artist after all. Thanks so much for reading and commenting. I adore making charms. 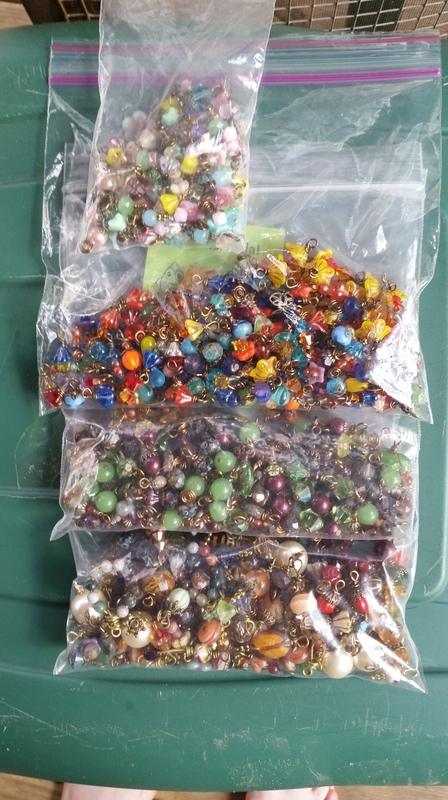 At Craft Shows I love to watch people pick up the charm bracelets and admire the special beads. That’s what gave me the idea for the Challenge. Just expanding on something I already love to do. I love those color combinations. They all really represent their season. So pretty. Thanks so much for reading and commenting. The color combos were the first choice I had to make and probably the hardest. Thanks so much for reading and commenting. I think Winter was the toughest because there isn’t much going on in Winter. If I had chosen Pansies it would have looked to much like Spring or Summer so I chose my favorite. Hellebore. And I’m really pleased with how it turned out. I really love your seasons! 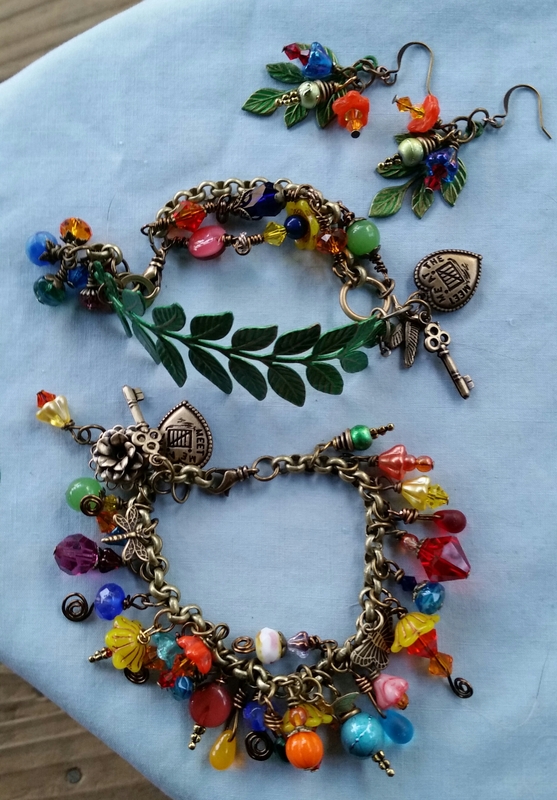 The colors are wonderful and your charms are just perfect! I think it is wonderful that you are making your charges. I really like the fall designs. Thanks so much! 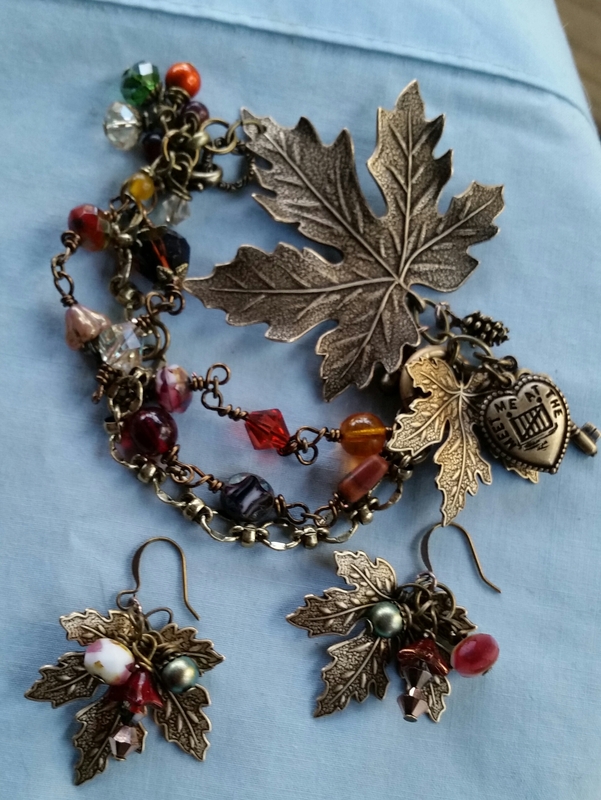 I love charm Jewelry and I love Nature Jewelry so it just seemed natural to combine the 2. Thank you! I didn’t want to do ice or cool blues so I chose my favorite Winter bloomer, which is Hellebore. They come in creams, pale greens, pinks and deep Burghandy so I thought it was perfect for Winter. I have a hard time deciding my favorite. Each day I lean towards something else! Thanks for reading and commenting. looking at your designs makes me miss beads. 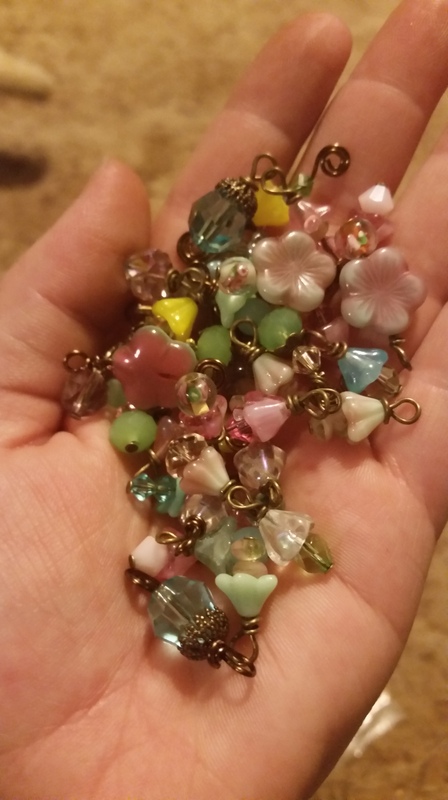 i want to get out some random handful and go nuts… love the colors! Then go for it!!! I love working with beautiful Czech beads and Swarovski crystal. 2 of my most favorite things. When you put them together you get magic. Thanks so much for reading my Blog and taking the time to leave me a comment. Means so much! 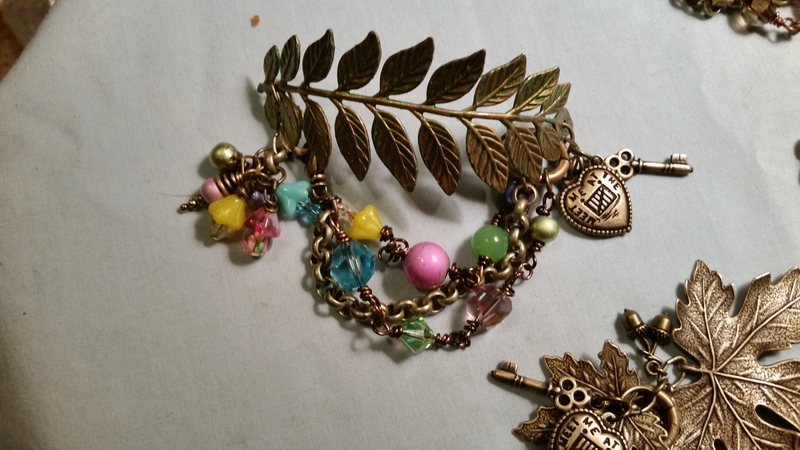 Leila I just love your line and all the beautiful little handmade charms your using, also the wonderful color choices as well. I love your blog post as well. XOXO! Thanks so much for reading and responding. I just love getting comments. 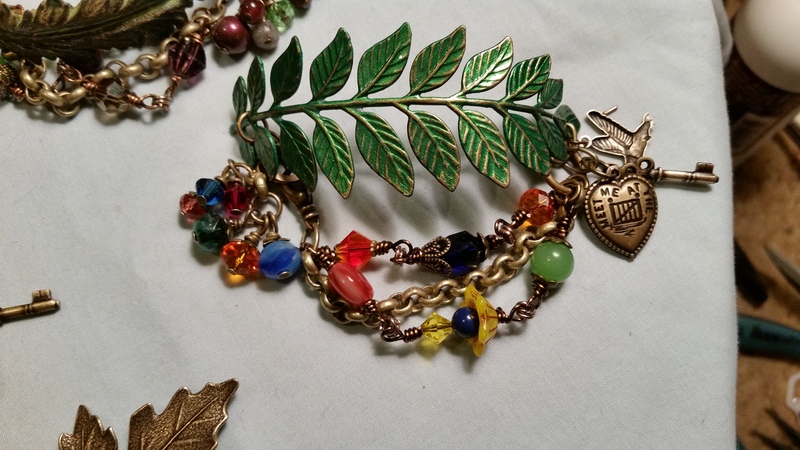 I made a few Fall beaded charm bracelets for the Fall craft Shows and sold almost every one of them. The customers just loved the unique Czech beads. So, I figured I could expand on that and hopefully be able to make something of myself so I can stay home with my boys. They’re motivating me but you guys are keeping me on track!! Thanks! You know, it’s hard for me to pick a favorite too. I guess it’s just the mood you’re in at the time. Party time? Go with Summer. Feeling neutral, go with Fall. Kind of lovey dovey, maybe Spring is right for you. Into, some dark, understated accessories, Winter may be for you.. who knows. But I’m pleased with how they’re turning out. Very pleased. Thank you for reading and commenting! I especially love those earrings! You have a very cohesive look for your line. Great idea on making the charms ahead of time. I do agree that saves time. Plus, those baggies of charm goodness make for a great blog pic! Keep up the fine work, your line looks wonderful : ) ~Renee H.
So pretty and delicate. Great job! 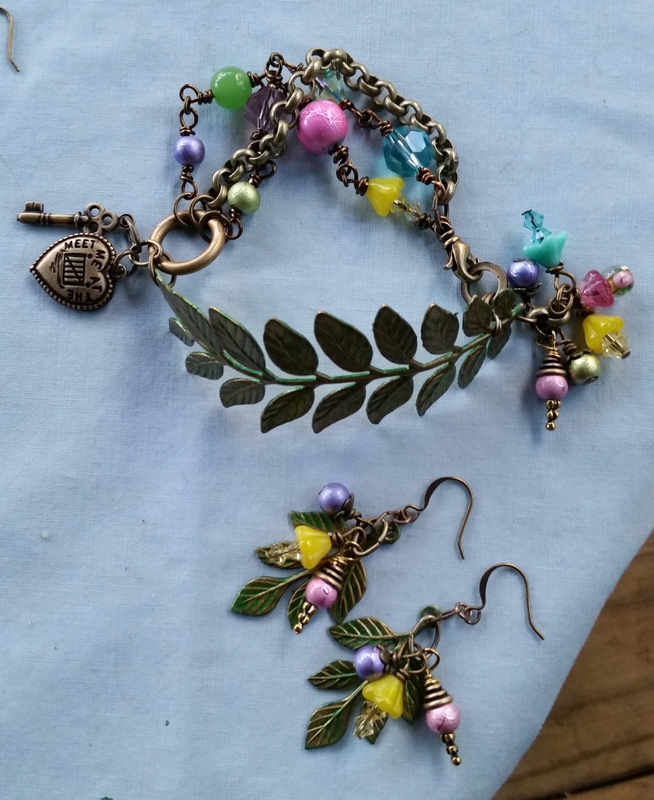 Love the earrings and bracelets with all the charms. So cute. Can’t wait to see the whole line ! Your line is fantastic! 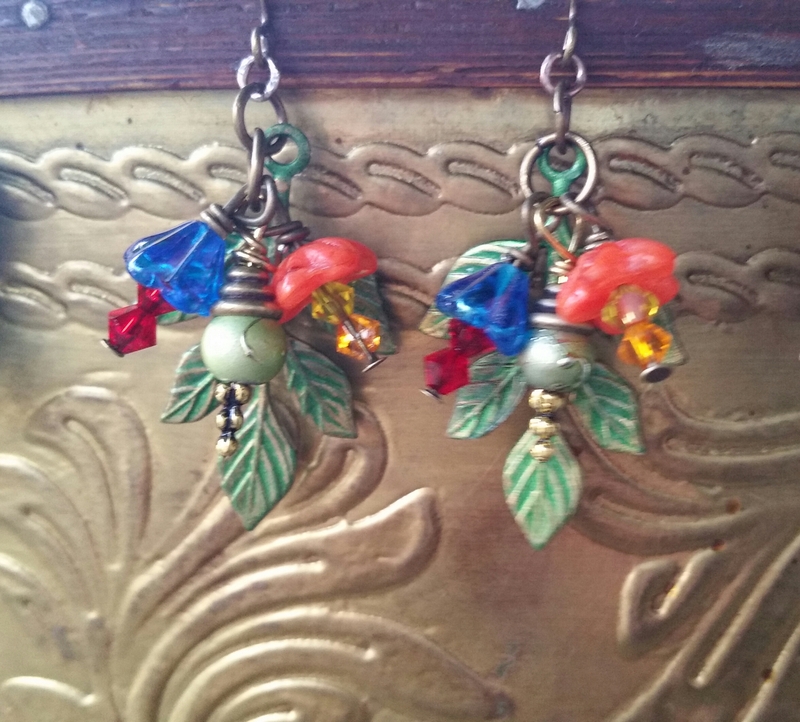 I share your love of Czech beads and I think they go so perfectly with the brass from B’Sue’s! You’ve been really busy getting all these pieces together and it’s paying off! I can’t believe you have pieces in all four seasons already! Very impressive. I have to say as sick as I am of this endless winter, I love your winter series the best! Well done!! Leila your charms are just perfect & the colors your using are really evocative of the seasons you’re expressing. The best thing is they aren’t limiting, you can wear them at any time! I think they’d look marvelous on any skin-tone. I adore the flowers especially. Those are some of the favorites from my bead collection/stash. 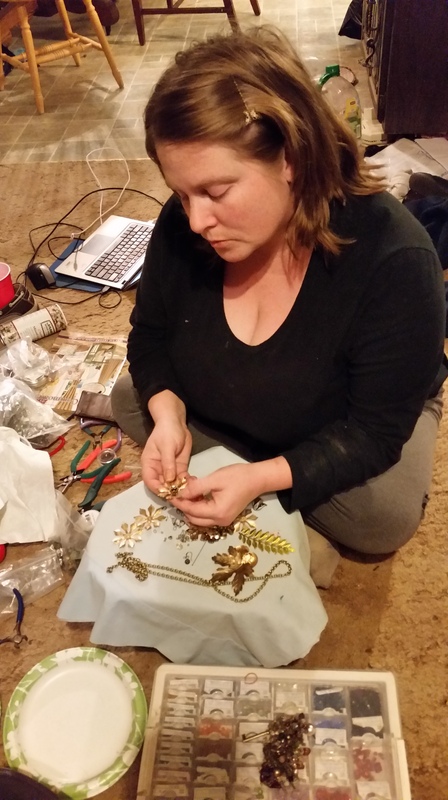 You have been super productive, wiring all those charms into lovely designs. Fall and winter are my favorite seasons and you’ve captured the feel of them with your colors. 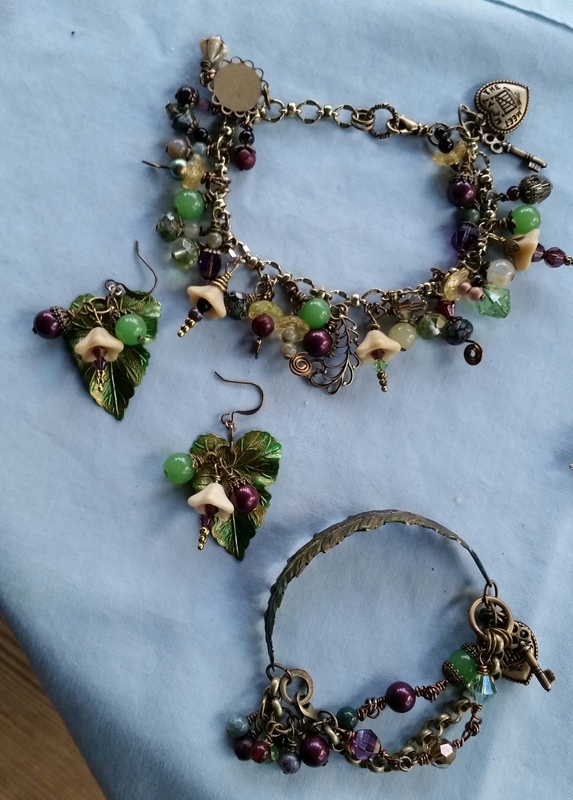 Really beautiful pieces and lovely color choices! I love your pieces! 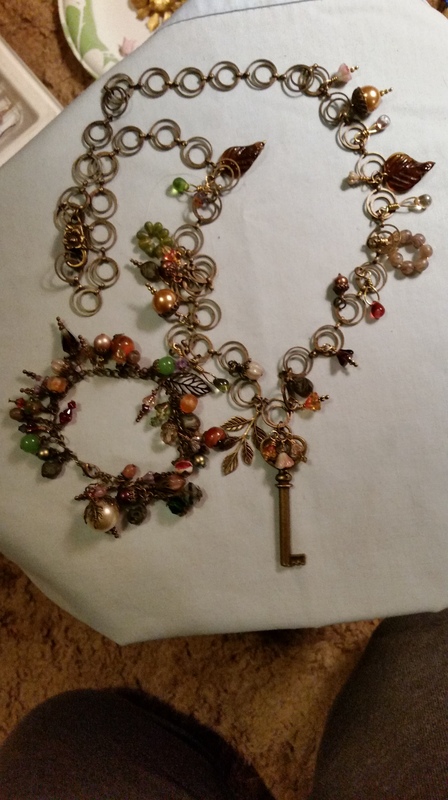 Get choice to make charms up first and a time saver! Best Wishes and so glad to be in this class with you! Great idea for a line- I am am all about the Seasons! looking forward to seeing the whole line in a month ! I like how you’ve found a way to create a cohesive line, while still retaining the “one-of-a-kind” spirit. The colors you’ve combined to create each season is fantastic! Leila–I really like the way your line is coming along. Love the four seasons theme and the colors you are using. I’m looking forward to seeing the necklaces and your finished line. Great stuff, it’s going to be an awesome line! Next Next post: Nature is the Key to Happiness – Grande Finale!! !